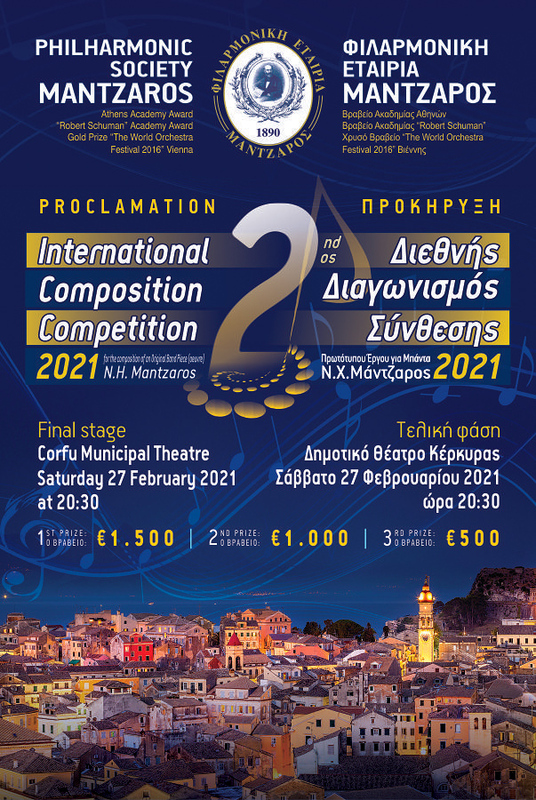 The MANTZAROS Philharmonic Society, always in the avant-garde of the musical field in Greece, is proud to announce the 1st International Composition Competition for an original piece for band named after the famous Corfiot composer N.H. MANTZAROS. The Competition was held for the first time in 2014, as a national event with considerable success. But as we strongly believe in the communicative force of music and feeling the universal need of young composers to present and test their capabilities we have decided to upgrade the Competition into an International event. Thus, the MANTZAROS band will have the chance to show its ability and further enhance its renowned fame, our Association’s history and contribution will be spread internationally and most of all, the name of Corfu with its rich musical history and tradition will be further promoted. The final stage of the Competition will be held on Saturday the 18th of November 2017, at a public concert in the Municipal Theatre of Corfu, where the six works that will have been selected by the international jury, will be executed by the MANTZAROS Band and the three prizes will be then decided by the jury and awarded in public. € 1500 for First prize, € 1000 for Second prize and € 500 for Third prize.